SANOPLANT is an amendment especially developed for improving moisture retention in sand, sandy soils and free-draining substrates. Made mainly of natural silicates, SANOPLANT has the ability to rapidly adsorb and hold water and any nutrients therein at plant available tension. Correct application of SANOPLANT will save water and nutrients, reduce maintenance costs, retain good drainage and result in a better quality turf or landscaping. SANOPLANT is environmentally friendly with a neutral ph., granulated for easy calibration and handling and remains effective for more than 10 years. Applications include sports fields (in particular those constructed with sand-based profiles), golf courses and greens, bowling greens, landscaping in sandy soils, forestry, revegetation projects, nurseries etc. Following years of success in the UAE, there are now many examples in Australia where SANOPLANT has been used with excellent results. SANOPLANT should be mixed into the soil in or below the root zone, encouraging development of a deep and strong root system. The tiny SANOPLANT particles store water in available micro-pores, so there is no soil destabilisation. Once the SANOPLANT reaches capacity, excess water will drain through as normal, so there is no waterlogging. The function of drying and re-saturation repeatedly lasts for many years. SANOPLANT will assist you to save water and nutrients, reduce maintenance costs, and produce superior turf surfaces and landscaping. Because SANOPLANT adsorbs moisture rapidly, even light rainfall will be stored. Less irrigation will be required, and irrigation frequency can be extended, saving you time and money. The held water and any dissolved nutrient is readily available to the plant, releasing water and nutrients to the roots. Sanoplant thus increases the soil’s natural capacity to hold water. The benefits of using SANOPLANT, apart from the saving of water and nutrients, is a stronger root system which means healthier and better plants and turf. This application also improves soil structure through increased organic activity and is effective in the soil for a long time! And because SANOPLANT does not swell or keep on absorbing huge quantities of water, air porosity in the profile is optimised; soil stability is improved, structure is not affected and good drainage retained. So there is no waterlogging and sports surfaces are more usable. 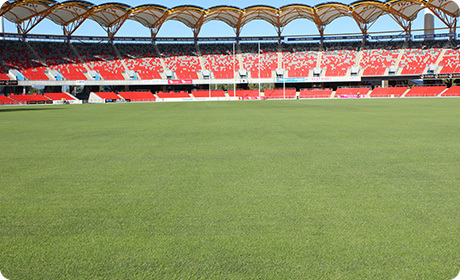 We have shown that a top quality natural grass surface can be achieved with less cost than a synthetic surface ……… with all the known advantages! The SANOPLANT granulate should be mixed dry into the sand / soil / substrate, in or just below the root zone. With the initial watering, the granules separate into tiny particles which rapidly “adsorb” the water and any nutrients therein; the water (and nutrients) are held under moderate tension by the Sanoplant, so that they are available to the plants as required. Once the Sanoplant has reached its capacity (about 16 times its own volume of water) the profile remains free draining, ensuring the ideal air / water ratio in the profile. As the water is held through a greater section of the profile, evaporative loss is reduced and with extended irrigation intervals the plants roots will seek the water held deeper in the profile, encouraging deeper and stronger root growth. With less applied irrigation nutrient leach is also reduced, leaving more available for the plants. Healthy root mass results in healthier, more resilient turf and plants. The stored water and nutrients are available to the plants over a long time period resulting in better growth and healthier turf and plants. 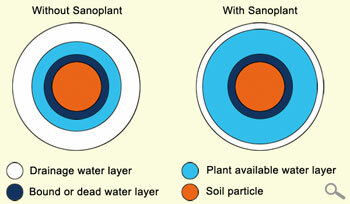 SANOPLANT increases the plant available water, storing water which would otherwise be lost to drainage. Nutrients in the water are held and are also available to the plants.